Nikon’s flagship full-frame mirrorless camera, the Z7, has an effective resolution of 45.7 megapixels in a compact, weatherproof body. Its refined ergonomics and comfortable grip make it pleasing to use. The single card slot accepts XQD cards but Nikon has promised CFExpress compatibility via a future firmware update. The new Nikon Z-mount has a flange focal distance of 16mm, which is nearly 2mm less than the flange depth in Nikon’s DSLR bodies. Its inner mount diameter is 55mm, the widest of all mirrorless systems. The Z7 launches with three high-performance lenses: 35mm f1.8 S and 50mm f1.8 S primes plus a 24-70mm f4 S kit zoom lens. Six more will be added in 2019 and a further three in 2020. Autofocusing is driven by algorithms that are optimised to include the FX (35mm format) sensor and will use focal-plane phase-detection AF or contrast-detect AF as appropriate. The Z7 can also record 4K video at 25 fps (PAL format) or Full HD at 100 fps and can deliver 10-bit 4:2:2 HDMI output. A new N-log Picture Control profile is available for recording to an external device via the camera’s HDMI port. New in-camera functions include diffraction compensation processing and a Mid Range Sharpening function that provides three levels of sharpening controls so users can adjust edge sharpening independently. High ISO performance is outstanding. The in-camera stabilisation – a first in a Nikon full-frame camera – corrects camera movements in five directions. 1. The Z7 body measures 134 x 100.5 x 67.5mm and weighs 675 grams with battery and card, which is two thirds the weight of the D850. 2. 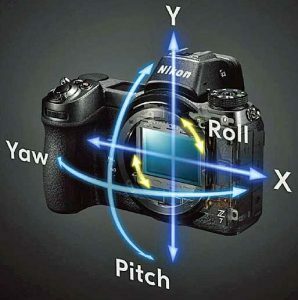 In Body Image Stabilisation (IBIS) makes its first appearance in a Nikon full-frame camera, providing shake correction across five axes: yaw, pitch, X, Y, and roll. It works with all lenses, including those fitted via adapters. 3. On-sensor phase-detection autofocusing (PDAF) technology uses an array of 493 detectors that provide accurate focusing across 90 percent of the frame. 4. With Z-mount lenses, the Z7 can take advantage of contrast detection AF, using the speedy actuators that move the focusing element group. 5. The 0.5-inch OLED EVF has a resolution of 3,690,000 dots, 100 percent frame coverage and a comfortable 21mm eyepoint with an eye sensor. 6. The new EXPEED 6 image processor is designed to optimise the sensor’s high pixel counts and maximise the resolving power of the new Nikkor Z lenses. 7. Legacy F-mount lenses can be fitted via the FTZ adapter without loss of performance. Street prices are currently matching RRP of $5500, which includes the FTZ mount adapter. Prices for the body and 24-70mm f4 S zoom lens are around $6200 and adding the adapter lifts this bundle to around $6500. In each case, with the Australian dollar sitting at around 70 cents US, you’ll pay more if you buy through an overseas website, even without the inevitable GST and shipping costs included. Some major sites won’t ship to Australia. Then there are the warranty and consumer protection issues.